Evaluate the RF emissions of mobile phone, radio and TV transmission towers, wireless camera, Wi-Fi and LAN detection and installation, microwave oven leakage and other environmental safety concerns. Radio Frequency (RF) is the range of electromagnetic frequencies above the audio range and below infrared light. Features maximum and minimum hold, an audible alarm, and a zero adjustment to eliminate background EMF. The display also indicates overload and low battery. Comes with a soft carrying case and standard 9V battery, which provides approximately 100 hours of use. Dimensions: 5¼" x 2¼" x 1¼" (130 x 56 x 38mm). Weight: 6oz (170g). Monitor vapor levels, simply and effectively. The badges are simply clipped on to the technician's clothing and a record is kept of name, location and time, providing continuous sampling for personal monitoring and allowing the measurements required under Government regulations. One badge provides continuous sampling over 8 hours. A second badge can be used to supply information for analysis of 15-minute peak exposure periods. This device is used as an aid when programming a microwave oven to achieve an ideal target temperature of 20-100µl staining volumes. The tool is designed to give quantitative temperature information about the droplet during staining of tissue sections on electron microscope grids. This unit is a 4-well "PTFE" coated glass slide, each well 8mm in diameter which will maintain the uniform shape of the droplet; 4 liquid crystal temperature strips ranging from 35 to 50° are affixed to each well to monitor the microwave oven temperature. 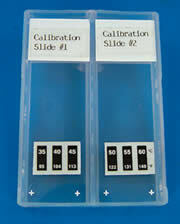 A calibration slide for microwave staining. 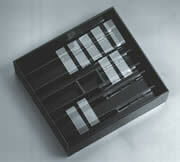 A set which includes two glass slides. Slide #1 has liquid crystal squares corresponding to the following temperatures: 35°C, 40°C, 45°C; Slide #2 has liquid crystal squares corresponding to the following temperatures: 50°C, 55°C, and 60°C. This calibration set will ensure reproducible programming of the oven to achieve an ideal target temperature of large staining volumes (50-200 ml solution). This container will permit rapid specimen handling and provides temperature information during microwave irradiation. A liquid crystal strip is affixed into the bottom of a 35mm diameter petri dish and covered with a thin layer of EMbed resin. The temperature range is 35°C-60°C. This container is ideal for tissue fixing by microwaves. The two active temperature windows are 45°C and 50°C. Made from polypropylene, Each line is spaced 1 cm apart with letters along the sides and numbers across the top and bottom. This tray has ruled lines that aid in the reproducible placement of the specimens in the oven. *The above microwave accessories are developed in collaboration with Dr. Gary Login, Beth Israel Hospital, Boston, Ma. For immunostaining, we recommend a water load that is the same size as the bottom of the microwave cavity in order not to disturb the distribution of microwave energy within the cavity. In our research, we found that between 150 and 200 ml of water in the bottom of the incubation tray prevents evaporation of the droplets of reagent. A PAP pen should be used to maintain the droplets at a uniform size and shape. Each holds 64 or 40 cassettes in a single horizontal plane, which conforms to research regarding the way to achieve the best distribution of microwave energy. It is based upon an original design in wood (the 'Bamboozle') developed by Dr. Richard Dapson of Anatech, Ltd. It is adapted to a pyrex container which allows the paraffin to easily hold its temperature, and minimizes the risk of overheating of specimens due to lack of sufficient microwavable load. We are very pleased to announce the development of a simple and reliable device designed to hold up to 24 standard cassettes for histoprocessing in a microwave. This new rack is manufactured from "PTFE" resins, and will withstand repeated exposure to fixatives, dehydrating agents, clearing agents and paraffin. It is easily cleaned in hot water. 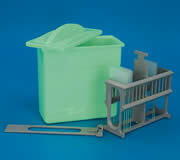 It is intended for use with a disposable tray which holds the processing chemicals. Four processing racks and trays will fit into the EMS 9000 Microwave Processor, so that up to 96 cassettes can be processed in one run. Using this system, the histotechnologist needs to handle the individual cassettes only once, to load them into the racks. The rack is then placed into a tray containing the dehydrating medium, usually 100% ethyl alcohol, and microwaved. After dehydration, the rack containing the cassettes is transferred into a tray containing the clearing agent, usually isopropanol, and microwaved. After clearing, the rack is transferred to a tray containing liquid paraffin, and microwaved. The whole process can take as little as 25 minutes (for small specimens, such as needle biopsies). There are no hazardous chemicals needed (no xylene !). 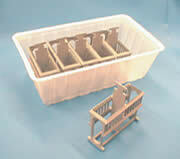 Polypropylene floating racks keep microtubes submerged in a water bath – perfect for controlling sample temperature. Detachable legs give the users more options: attach legs so rack stands upright on benchtop, or detach legs so sample tubes can be quickly popped out by pushing down onto any surface. Not autoclavable. Measures: 60 mm high, including legs. Shandon Lipshaw's patented Coverplate technology is the foundation of our microwave immunostaining system. Increased quality control, time and reagent savings, specimen protection, and consistent superb quality stains can be expected when using our Coverplate Microwave Immunostaining protocols.